I love homemade bread, but it’s rare I find a recipe I love. Today, I found a really good recipe. I got the recipe from a home cook who shared her mother’s bread recipe online. I will definitely be making this recipe again. The dinner rolls were light, soft, and really yummy. I think this recipe would be great as sandwich loaf bread too. I filmed how I made them, and you can see the video below. If you want to make this recipe here it is! Mix yeast, sugar, and warm water together in a tall glass, cover, and set aside. In a large bowl, mix flour, salt, and additional sugar together. Then, add the yeast mixture, additional warm water, and oil to the flour. Stir together until a dough forms. On a lightly floured board, knead the dough for at least 5 minutes, or until it comes together. I had to use an additional cup of flour when kneading. Place the dough in an oiled bowl, and cover and let rise for 1 hour. After it has risen, shape the dough into rolls, and place them on a baking sheet lined with baking paper. Cover with plastic wrap, and a tea towel, and let rise for 30 minutes. Pre-heat the oven to 375F/190 C.
Bake the rolls for 30 minutes or until golden. The original recipe is a lot larger. I scaled it down in half, which made 16 large/medium dinner rolls. So the recipe written above is half the original recipe. 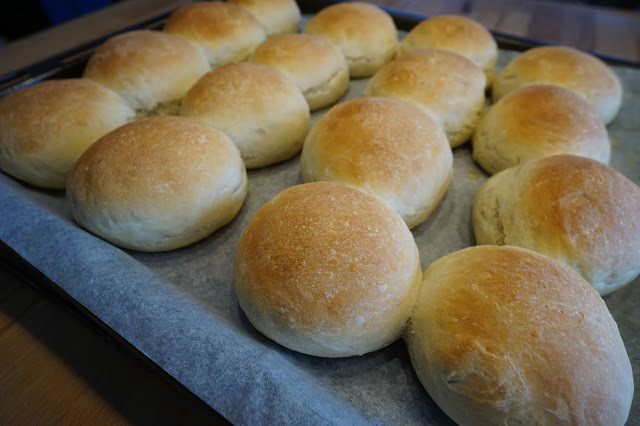 If you want smaller rolls you can divide the dough into 32 pieces to make 32 small rolls. Also, I changed a few steps in the recipe, such as brushing the rolls with butter before you bake them, and not after. I hope you enjoy it.